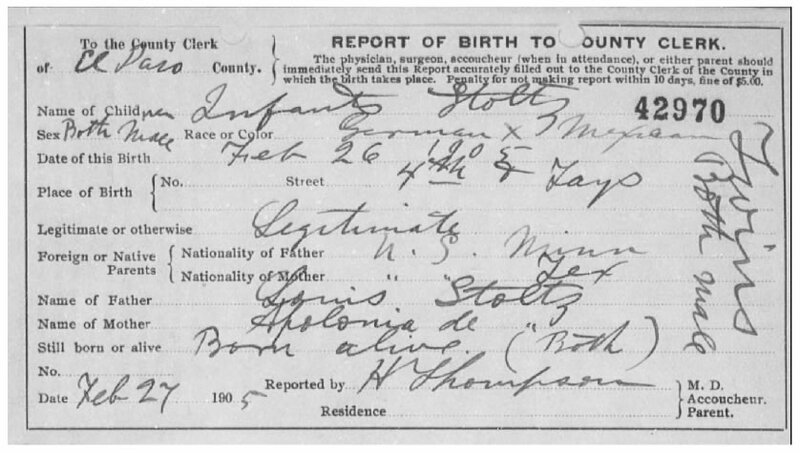 We all knew about the eight children my great-grandparents Ludwig Josef “Louis” Stolz (1866-1958) and Apolonia Luján (1872-1929) raised in El Paso. One of these children, Louis Gustave Stoltz, died in 1928 at the age of 30. The other seven are the progenitors of the California and Texas branch of the Stoltz family, while my great-grandfather’s siblings all remained in the north in a swath stretching from Minnesota through North Dakota, Montana and Washington. The State of Texas has digitized and made available online decades of death certificates. Through this rich treasure of documentation I was able to find information about Louis and Apolonia and almost all of their children, including another two our family was not aware of; a girl born in July 1913 who lived only a week, and a boy stillborn in 1915. But there were no death records online for the twins, and no one in the family had ever heard of Louis and Apolonia having twins. What happened to them? The only clue I had was the old Texas Death Index, which lists names with year of death and a reference number. In 1905 there was listed an Edward Stoltz, and in 1906 a Henry Stoltz. Could these be the twins? No parents were listed. I wrote to the El Paso County Clerk hoping the death certificates could be found and were somehow missed in the state’s records digitization effort. What is inanition? It is the exhausted state brought on by malnutrition or starvation. It’s not a word commonly used in medicine today. How did the children starve? Louis and Apolonia at the time already had five children, but the fact that they had a regular doctor seems to indicate this could not have been the result of extreme poverty as the other children survived. I’ve been unable to find Louis and Apolonia in the 1900 U.S. Census, but in the 1910 census he said he rented the house on Tays Street and was employed as a salesman in a cigar store. Certainly not rich, but apparently able to provide. As I understand it, “inanition” was used to describe a state that began in utero due to some defect in the placenta. Thus a newborn would die of inantion, but a baby that survived beyond the neonatal stage and died of complications from the same condition would typically be ascribed a cause of death as “failure to thrive,” meaning they never were able to fully process nutrition. Sometimes this was due to a defect in breast milk at a time when there was no such thing as prenatal care. It is almost beyond imagination to think of what it must have been like for Louis and Apolonia. Most likely Edward and Henry were born prematurely, which in 1905 practically assured death. After the fairly quick death of Henry, one can only imagine the pain they must have experienced over a period of more than a year as they watched Edward unable to grow and finally perhaps to slowly starve to death. One can imagine in those days women might even blame themselves for such a tragedy. Of their 12 children, Louis and Apolonia saw two-thirds survive beyond youth; one died as a young adult. Why the painful story of the twins was never passed on may be due to the fact that the oldest of the children, Charles, was 10 at the time and would have likely been the only one old enough to remember. Henry and Edward Stoltz are my granduncles. I stumbled across your blog while researching pellagra and inanition. I am glad that you were able to get the information that you searched for regarding the twins. Isn’t it great when we can knock a hole in the genealogical brick walls? I have been through many death certificates online tonight trying to find my great-grandmother’s twin sister who shows up in the 1900 census, but not in the household in the 1910 census. It was very sad to see all of the babies that died from inanition, starvation, malnutrition & dehydration. Very sad. I am wondering now if the babies that I saw that died of this were indeed victims of failure to thrive versus a true starvation (as in not getting food at all). That is the only way that I can process it…I can’t imagine living and watching my baby starve to death. The times were so hard for so many in years gone by, much as they are for many still. Best wishes to you in your genealogy adventure!